There are a handful of these still needing to be gifted, but I think they're all non-blog readers so I'm safe in sharing this now. 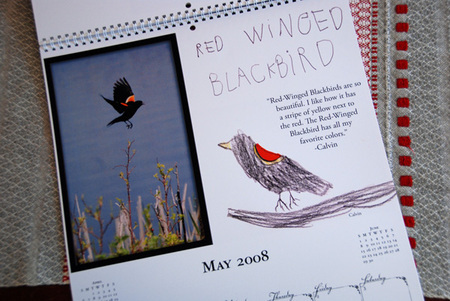 This was our little gift for the holidays - a calendar of birds! This project began in the spring, with the arrival of our first robins of the year. 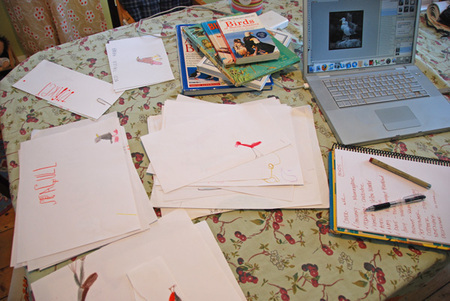 The pile of bird drawings starting growing...and the boys started dreaming up what they wanted to make with all of their bird love. Publish a book, make a movie - oh, the list went on and on. 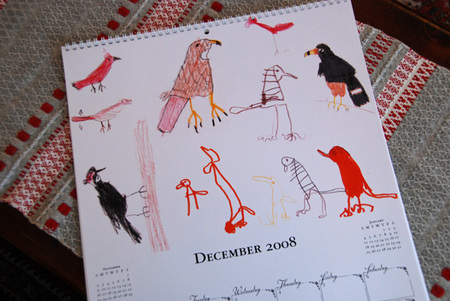 And they set to work - creating bird drawings, learning about birds, writing the names, and mostly - thinking, dreaming and watching the birds. Oh yeah, and there was a lot of screaming for me and my camera whenever a new one came by that we didn't yet have a photograph of. 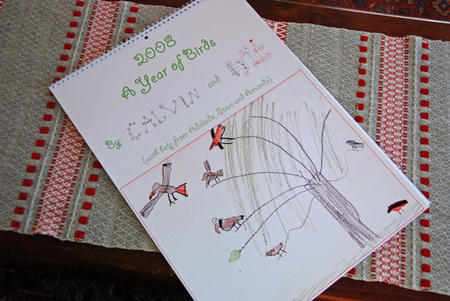 By September, I had gently talked them into chanelling the book ideas (for now ...I'm fully anticipating the "bird book" idea being resurrected in the spring by these ambitious little ones) into a calendar, which thankfully, they loved the idea of as well. 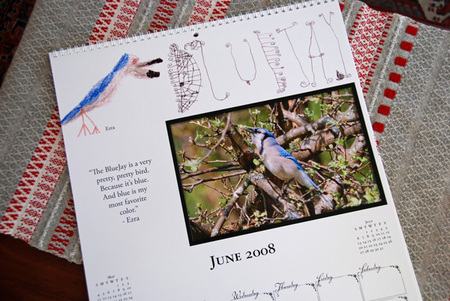 Each month's page features a photograph by Steve or I, drawings of the birds, lettering of the birds, and little commentary by the babes. The piles of stuff floating around here for this were plentiful - hundreds of drawings, folders everywhere. At one point, Calvin was using an Excel spreadsheet to keep it all organized. Love that. I created the images for each month in Photoshop, and then uploaded it all to Lulu.com for publishing. That end of the process was smooth and easy. I am so thrilled with the quality of the calendars - it was even better than I expected. 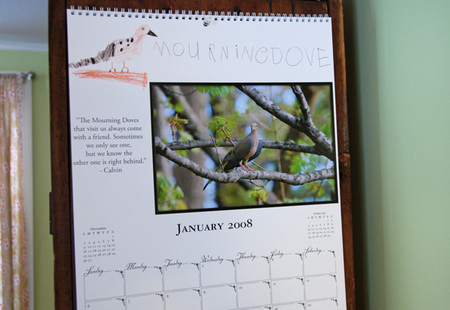 We printed these on the over-sized (13 X 19") premium calendars - the size is perfect for this kind of project. I seriously don't think any project has caused me so much frustration (okay...boredom is really the word - I scanned no less than 58 images), nor nail biting (as we waited for UPS to deliver it ... on the 21st!). But I can also say that few projects have been such a joy to be a part of. The kids worked SO hard on dreaming this up, putting it all together, and sharing it with those they love - watching them see it through to fruition was pretty awesome. 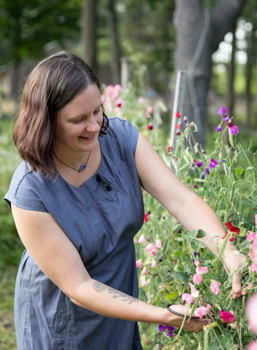 It felt like a wonderful way to share something 'handmade' with those we love, as well as serve as a little record of how very much of our year was spent with the birds.